I have read a number of interesting reports and pieces of content over the last few weeks, one of which was Salesforce's, The State of Sales. It's 61 pages long, so takes a good hour to sift through but I thought it useful to share my key takeaway: the importance of superior customer experience. In short, the report states that the marketplace has opened up in a big way, with 82% of B2B buyers saying that due to technology it's easier than ever to take their business elsewhere (p.6). This crowded and competitive marketplace means that every organisation needs to provide a better business experience to not only win, but to retain that customer. What does a better sales experience look like? In the screenshot below, you can see the characteristics which a typical B2B buyer demands in a salesperson. It would be fair to say that these fall under the moniker of a "consultative salesperson." As such, not only has there been "a stark mindset shift in sales" with "customer experience becoming the standard bearer for success" (p.11) but "customer experience/success is ranked as the top KPI used by sales teams to measure success" (p.10). Of course, traditional wisdom dictates that predictable revenue is derived from consistent lead generation (see Aaron Ross' excellent short read on Predictable Revenue), however, what this report is really trying to get across is that for truly superior business performance, delivering a superior sales experience is key. The hard bit is putting this all into action. How to improve the sales experience? 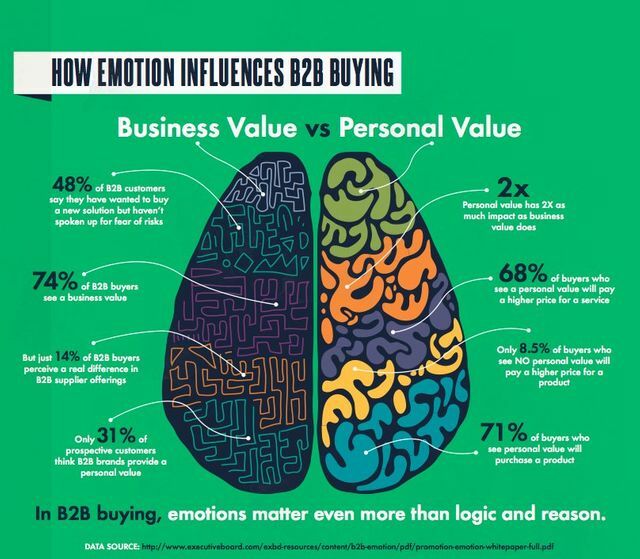 The first image sets out what B2B buyers want in salespeople, but ultimately it is hard to build this level of trust. In short, they understand the business and actually care about your success, as much as their own. How might you subtly send this message? Credibility: Inspiring confidence is really important and demonstrating your expertise is a good way of doing this. Another way of growing your credibility is through obtaining referrals from trusted sources - if someone else will stick their neck out for you, you're in a good spot. Creating insights: Regular, relevant insights not only boost your credibility, but they should also be of use to your clients. Industry relevant content from a trusted source can only add value to the sales relationship and educates them before, during & after the sales process. Broaden their understanding of the marketplace: Linked to the above, the Challenger Sale methodology advocates 'reframing' the problem of the client in a way which teaches them something about their industry and makes them think differently about it all (see this post which explains a bit more about the Challenger Sale mentality). If you can teach that individual/organisation about their own industry, that is incredibly powerful.